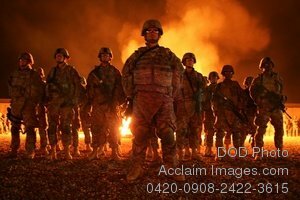 Description: Free, public domain image: Group of New Blackhawk Warrior Soldiers Standing in Front of a Ceremonial Bonfire. 6A bonfire lit the sky of Babil Province, as noncommissioned officers from the 172nd Infantry Brigade welcomed 22 graduates into the ranks ofleadership at the first-ever Blackhawk Warrior Leader Course in theater.The week-long accelerated training program has a focus on over 20hands-on, performance-based skills ranging from Iraqi security professionalization to fundamental lifesaving skills. (U.S. Army photoby Pfc. Bethany L. Little.